An Onondaga elder once explained to me that plants come to us when they are needed. If we show them respect by using them and appreciating their gifts they will grow stronger. They will stay with us as long as they are respected. But if we forget about them, they will leave. The summer of 2016 was when everything started to change for me. The most obvious change was in my professional life, as I moved from my long-held position of executive director with the Pennsylvania Association for Sustainable Agriculture (PASA) to the Initiative for Food and AgriCultural Transformation (InFACT) at The Ohio State University. My title remained the same, but almost everything else is completely different in my work life now. Other changes occurred or began over this period, and they will always be merged in my memory as a single complex transition that may take some years to play out completely. The immediate point here is that I simply had no time to manage my nearly 4,000 square feet of garden space over this growing season, and my choices were to either put in a cover crop for the whole summer, or try something that would require the lowest maintenance possible. Since I have always been fascinated with ancient forms of agriculture, I decided to try a Native American style “three sisters” garden, utilizing heirloom varieties of corn with pole beans and winter squash, to see if this style of companion planting really could manage itself. Truth be told, I added a fourth sister in the form of several sunflower varieties interspersed with the other crops, and bordered the outside of the plot with other things I like, including summer squash and okra. The result of my experiment can be seen in the photo currently used as the heading of my blog, which was taken in early September. As you evaluate it visually there are a couple things to keep in mind. First, and despite my best intentions, everything was planted about a month later than what would have been ideal. Second, the garden was greatly hindered by periods of both too much and too little rain in this very strange climatic year, a challenge that I’m afraid is becoming the new normal across the country for avid gardeners and professional farmers alike. Altogether there are three varieties of each of the four sisters spread across the plot. I have learned a lot along the way, and continue to discover new things from this trial planting. One thing you’d expect is that some varieties did better than others, which is pretty much the intent of such a diversified approach. Other years would naturally favor different combinations. Another hoped for result that did not disappoint is that I avoided heavy weed pressure, which is part of the magic of a system like this. I had only gone over the plot once with a manual hoe after the corn sprouted and before planting the other companions. I was also glad to observe some of the tallest corn I’ve ever grown in a garden – 8 to 10 feet – which was done without any soil amendments at all, except for whatever the beans were able to provide. What I didn’t expect is that the patch now has the feel of a whole new world, as opposed to just being a garden. A walk through, which has to be done gingerly, generates a sense of being in an exotic environment, complete with plenty of birds and pollinator activity. It is downright pleasant in there. And what’s more, I can reliably emerge on the other side, after zigzagging my way through, with enough vegetables for a meal or two. The gifts of the garden certainly outweigh the effort I put in, and the biggest harvest is yet to come! My little native garden patch is but a shadow of the historical practice. Native Americans are thought to have cultivated much larger pieces of ground with an even greater variety of plants, and often in conjunction with multiple stories of growth including trees bearing fruit and nuts. Some berry brambles on the side might have been used to dissuade wildlife from overrunning the site as well. And an occasional controlled burn helped with fertility and maintaining a broad variety of perennials. Managing the grazing patterns of bison and other wildlife was probably in their repertoire as well. What a unique and vibrant scene it surely was. In the end the natives were much more susceptible to the infectious diseases Europeans brought with them than they ever were to lack of food security. Still, over 500 years after Columbus sailed the ocean blue, descendants of at least two of the three sisters – corn and beans – continue to dominate the agricultural landscape of North America. And as I recall, winter squash in little jars played a leading role in feeding my two children when they were quite young. These native foods, plus many others like potatoes, tomatoes, peppers and even chocolate, continue these many centuries later to provide a big part of the American diet, and that of the rest of the world too. However, the basic practices of native agriculture have only barely survived, and thanks most notably to the sustainable farming movement that they have at all. We may not immediately recognize it, but everything from diversified cropping systems, crop rotations, companion planting and cover crops, to forest farming, rotational and multispecies grazing, permaculture, medicinal plant propagation, and even aquaponics, may all share roots in native agriculture. I’m sure other experts could add to this list. Many of these techniques are even being “discovered” as aids to healing larger scale, industrial systems of agriculture today. In many ways, the native farming systems that were little understood and nearly wiped out, as was the case for their practitioners, continue to offer promise of preserving the human species and our common environment for the long-term future. And yet we trudge along as rather unwitting and ungrateful recipients of such special cultural gifts, while the need could hardly be greater for us to acknowledge the skills and wisdom of those who occupied this land before us. Personally, I find the writings of Robin Wall Kimmerer, an accomplished botanist and member of the Citizen Potawatomi Nation, to offer perhaps the most refreshing view of the challenges we face in understanding and restoring the natural world today. Her striking quote about plants coming to us when they are needed exhibits an attitude about nature that is as scientific as it is spiritual . . . two views of the world that probably would not have seemed distinct in traditional native culture. This is how I felt when walking through my garden this year, as though I had created an opportunity for the scientific and spiritual world to merge, resulting in a virtual Garden of Eden to keep me both fed and satisfied with my place in the world. It is not just plants that come to us as needed, of course – people do too. Our challenge as humans is to recognize the importance of both plants and people coming into our lives just as we need them most. They are easy to miss, and even easier to lose if we fail to respect and care for them in proper measure to their importance in our lives. This is not some kind of New Age retreat philosophy I am espousing here, but the very foundation of what it means to be a response-able human being living in the world, with a capacity to love and nurture the most important aspects of our lives in community. Our exile from the plant world, and from the sources of our food more generally speaking, threaten to leave us physically insecure, and unhealthily under or overfed. Our exile from each other can breed the kind of distrust that we commonly experience in the world today, and more personally, leave us wandering aimlessly through life as though following a vague map of emotional independence that leads nowhere enduring or particularly satisfying. Which leads me to the greater point of this essay. Is it possible that not only plants and people come into our lives in mysterious and timely ways, but that an entire People could as well? I have been inspired and hopeful watching the many native tribes coming together in North Dakota to fight the Dakota Access Pipeline in recent months. While their official stance is in opposition to this one specific project, the fight is really more deeply rooted in the issue of tribal sovereignty, and now extends to the questions of climate change and whether or not we should be extracting oil from new and harder to reach sources at all. The key here is that these events are raising the consciousness of American Indian tribes broadly speaking to become the conscience of our whole society on important issues of sustainability. If they can maintain such focus and intensity as we have already seen, this could be the beginning of a necessary reawakening for our entire country, and even the world. We have long been in need of fundamental renewal in this country, and the emergence of a Native American voice in defense of the continent and planet we share is indeed an opportunity we should not fail to meet with a respectful and impassioned positive response. This is not only true when considering sources of fossil-energy we rely upon, but of food as well, which is just another form of energy. Our dominant agricultural paradigms represent an assumption that technology will solve everything. But instead we have arrived at a place where they are not working very well for either public health, or the farmers who work so hard to keep their economic treadmills spinning. Maybe it’s time we look back for inspiration . . . waaay back. There is in life no pristine past or utopian future to which we can aspire, regardless of what the politicians of one party or another might want us to believe. There is only the present predicament, and the necessity we all face to overcome the challenges with which a couple centuries of extractive living and abject denial have saddled us. But that is all we really need, a chance to start over, particularly if we are willing to listen to the spirits of this land who are still with us, at least for a little while longer. Every moment is pregnant with the possibilities of what can be accomplished if we as a People can come together with a sense of common purpose and the sacrificial will to get things done. Author’s note: This piece is dedicated to my daughter Kerry, who is currently toiling away as a Peace Corps volunteer in Paraguay, trying to do the right thing by the plants and the people coming into her life down there. 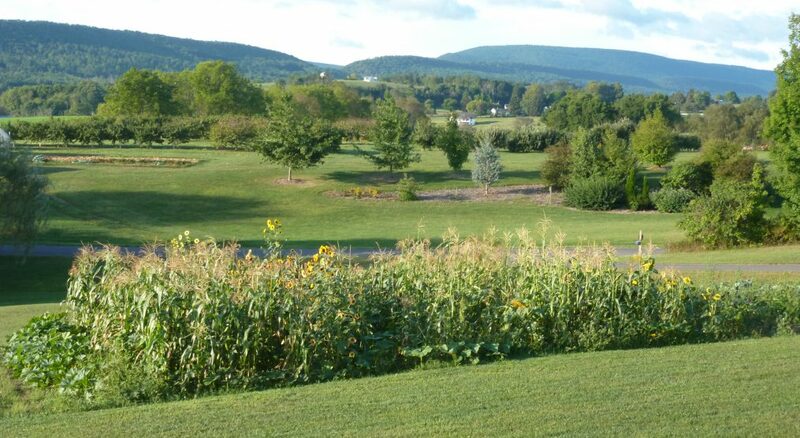 We have come a long way in the 15 years I have been privileged to serve as executive director of the Pennsylvania Association for Sustainable Agriculture. When I first started, I remember being ridiculed or, even worse, ignored in a lot of public contexts where PASA now is a welcome voice for change. For this we can feel some pride, while also thanking myriad other national groups and personalities who have paved the way, often in the face of withering uphill battles. Words matter. Though faced with abuse and even cooption of the word sustainable by corporate interests wanting to steal our thunder or undermine the power of our ideals, we must never give in to that. Other words like natural, local, and fresh are similarly threatened, even within our own ranks, but we must never relinquish or walk away from the words that got us here in the first place, even as we develop more descriptive terms, like regenerative, to convey the significance of our vision. I am not much of a professional sports fan these days. But every year at this time I remember myself as a kid, pulling out my old Maury Wills baseball mitt and Carl Yastrzemski bat from the basement to play outside with my friends, following what seemed like endless winters while growing up in the Midwest. Throwing a baseball back and forth for hours felt like absolute freedom. And every once in a while you could reach an exalted state with a best friend whereby the two of you would feel at one with each other, the gloves and the ball – nothing would miss the mark, until you fell out of that groove due to fatigue, or maybe the dinner bell ringing.